Leading Manufacturer of aluminum composite panel from Mumbai. Aluminum Composite Panel (ACP) is a widely-used term, describing flat panels that consist of thermoplastic core bonded between two aluminum sheets. ACP cladding are frequently used for external cladding of buildings (building facades). The main advantage of ACP cladding is that, it is very rigid and strong, despite of its light weight. Due to the ability of painting the aluminum in any colour, ACP cladding are produced in a wide range of metallic and non-metallic colours as well as patterns that imitate other materials, such as wood or marble. Applications of ACP cladding are not limited to building’s external cladding; they can be used in any cladding application, partitions, false ceilings etc. Aluminum composite panel are available in various thickness and various brands. 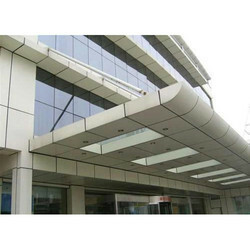 ACP cladding sheet are excellent in finish and are PVDF coated which is up to 35 micron. ACP cladding can be bent, cut, drilled, punched and easily shaped into complex shapes. ACP Cladding can be Easily installed and fabrication save cost and time periods of construction. Ultra modern look and excellent flatness. Sound insulation and pollution resistant. Acid, alkali and salt spray resistant. Smooth paint finish and stability of flatness. Resistant to blow and breakage. Ease of installation and fabrication.